This deleted scene from Star Wars The Force Awakens should serve as a serious reminder to all First Order agents why you should never piss off a Wookie. The scene, which was cut from the movie but s available of the special edition Blu-Ray, takes place during Rey, Finn, Han Solo and Chewbacca’s visit to Maz Kanata’s castle and would have ended the foul Unkar Plutt’s story. 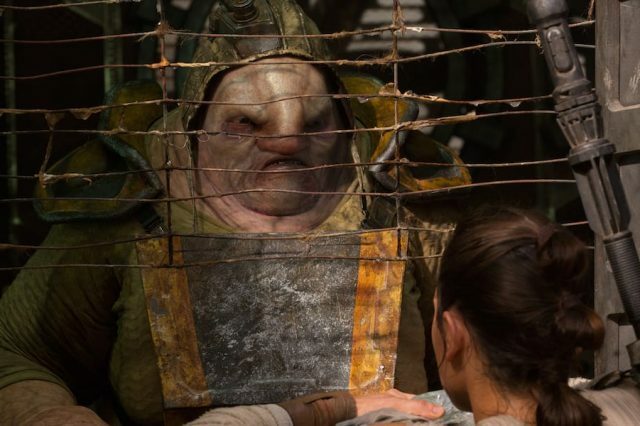 Just in case you don’t remember Unkar he was the beastly junk dealing alien on Jakku who screwed Rey out of her alloted portions and tried to have BB-8 scrapped. The deleted scene would have had Unkar confront Rey about the theft of the Millennium Falcon, which for the record he stole off someone else. When the reluctant Jedi tries to intimidate Unkar with a blaster though he quickly disarms her and threatens her with her own gun. Fortunately for Rey though Han’s loyal best friend Chewie intervenes, taking the weapon off Unkar and giving it back to our hero. Not frightened by the wounded Wookie, he was hurt when escaping the Guavian Death Gang and Kanjiklub. Unkar gives Chewbacca a shove. Unfortunately for Unkar Chewie may be hurt but he’s still a beast and he wastes no time in literally disarming Unkar by breaking the junker’s arm, before ripping it off. What is it with the Star Wars universe and people losing their arms in bar fights?